This one-day Osaka foodie itinerary takes you through some of the highlights of Osaka’s vast culinary scene. 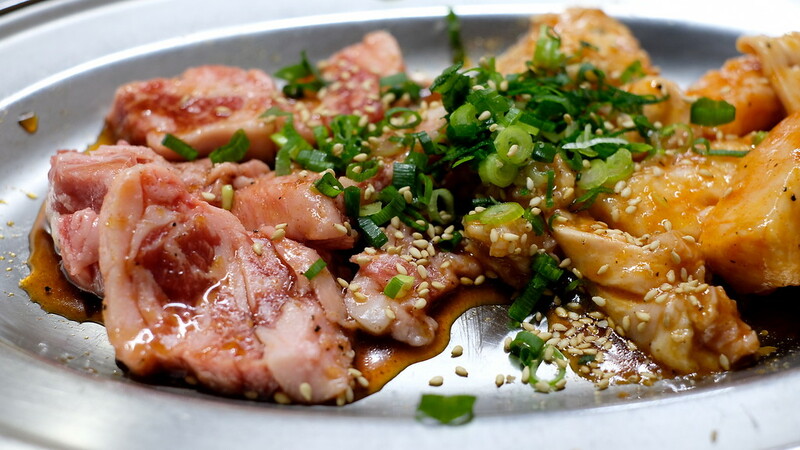 It includes the famed Kuromon Market, fabulous mochi and takoyaki, killer okonomiyaki, and glorious Japanese beef. If you do wish to take photographs, ask first, and be discreet and respectful about it. If there’s a sign that says don’t take photographs, respect it! Grazing and snacking at many different places is going to generate a lot of plastic waste. Circumvent the plastic wherever possible. Bring your own cutlery and handkerchief, and ask the shop staff not to give you any. Refuse the plastic bags that each and every snack will be put in. Forgo your straws and forget the lid on your takeaway latte. Even better - ask them to put it in a cup and have it in store. Every little bit helps. We’ve put directions to each location in this itinerary AFTER the location to avoid cluttering things up. We’ve put all of the places listed here, and the walking routes in each area, on a special map of this itinerary. Scroll down to the end of this itinerary to view the map. You could theoretically do this itinerary alone. But this is best done with a friend to maximize eating opportunities. It is a cliche to begin with this observation which is nevertheless true: Osaka is the city of kuidaore, or to eat until you fall over or go broke. While Tokyo may boast over 300 Michelin stars and counting, Osaka deserves just as much love, if not more, for its cuisine. Osaka has no shortage of high-end restaurants, but where it excels is in B-grade cuisine - no-frills, hearty, rib-sticking dishes that don’t require you to sell a kidney and half your liver just to fund a day’s worth of food. There is so much more to this city than a single day of eating can cover. But this itinerary isn’t a bad place to begin. Call up your best eating buddy and hit the streets: you’re going to eat Osaka. If you’re going to wake up early to eat your way through Osaka, there are few better places to begin than Kuromon Market. 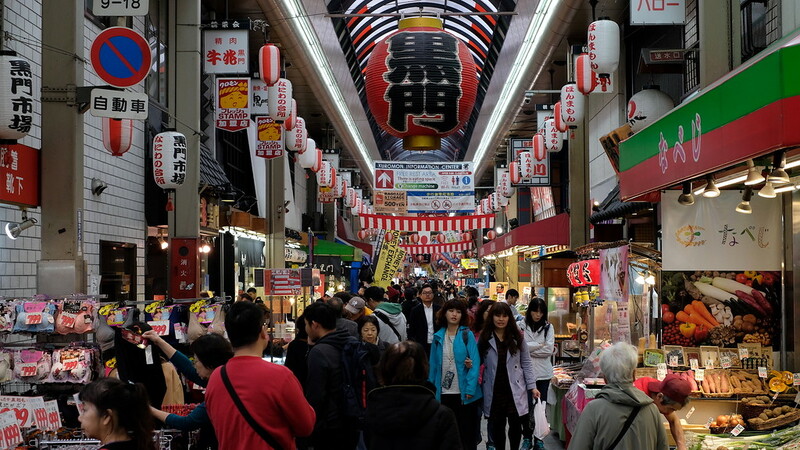 Affectionately nicknamed “Osaka’s kitchen,” Kuromon Market consists of around 170 stores across a 600-meter stretch, with several entry points along the way. Many of shops here cater to professional chefs who arrive before the tourists do to pick up ingredients for the day’s work - fine meats, vegetables, fruits - and there are other sundry shops hawking everything from socks to slippers, giving Kuromon a relatively local feel. After 10am tourists begin pouring in, so you will want to visit the market before this. Kuromon is far more pleasant when you are not navigating the space along with several hundred other people coming in and out. What can you eat here? Anything and everything. I think it might even edge out Tsukiji in terms of the sheer lavishness of its displays. There are the obligatory skewers of grilled prawns, scallops in their shells, Styrofoam trays of sashimi in thick, obscene slices, jewel-like rows of pink and green rice cakes, sizzling plates of stir-fried noodles. Welcome to gustatory Stimulation Nation. As a place to visit, it has everything the first-time visitor to Japan could ask for. Eating seafood here can be hit or miss. Kurogin Maguroya has an outpost here where the tuna bowls and rolls are, as in Tsukiji Market, worth any stomach space you wish to spare. 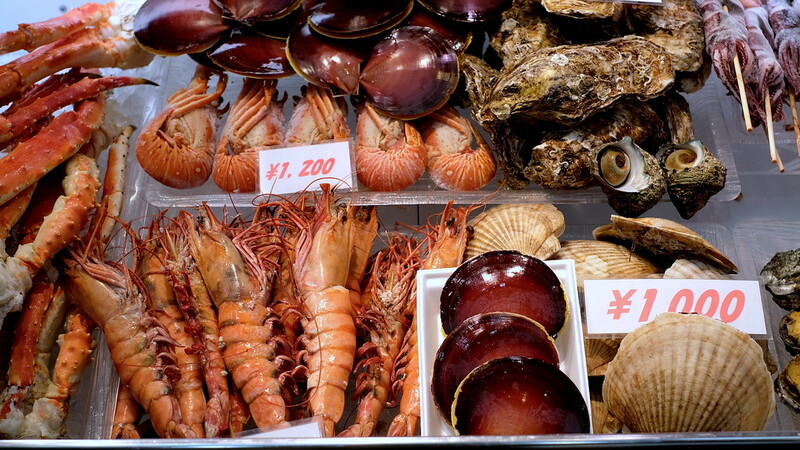 But by and large, most of the seafood offerings are overpriced for what they are. 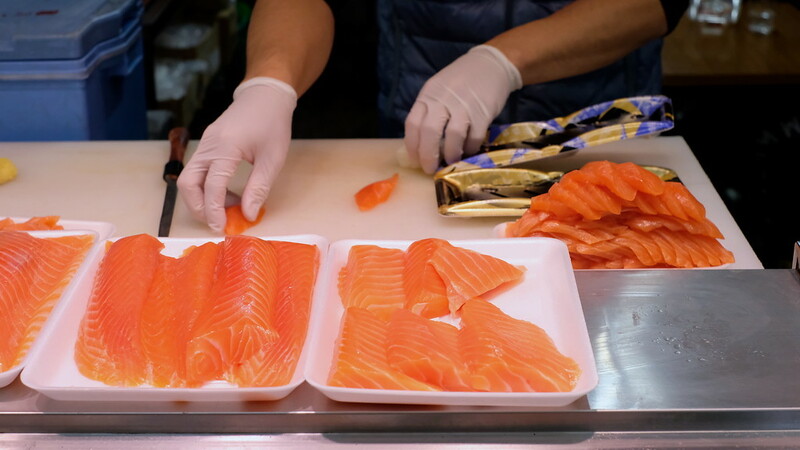 True, even the cheaper trays of sashimi are leagues above what you get in most European or North American sushi shops. But you’re in Japan and better off eating it somewhere else. Most sashimi on offer is fresh but of middling quality, and hardly improved by the acrid, metallic-tasting soy sauce accompanying the fish. Serious eaters wanting to try some sashimi nonetheless should perhaps consider BYOS, or bringing your own shoyu. 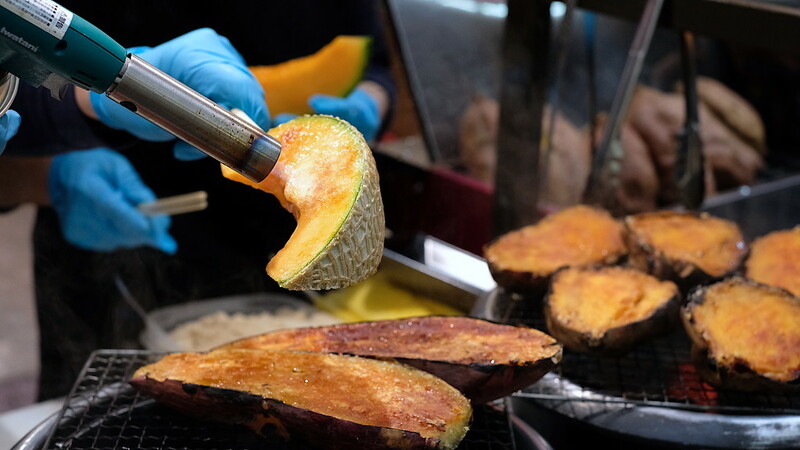 Though it might not be everyone’s cup of tea, it’s worth trying a slice of grilled melon at the booth outside Sennariya. They sprinkle each wedge with sugar before torching the surface until it’s covered with lacy, crackly, caramel. Do as I didn’t and skip taking a photo: you will want to eat this as quickly as possible, while it’s hot and darkly sweet on the outside, cold and juicy on the inside. I suspect the melon will be even better in summers than winters. Wandering around Kuromon Market is fun, but can be so much gastronomic distraction. Now, I would make a sojourn to Kuromon Market for two items alone. One is a cup of warm soy milk from Takahashi Shokuhin, which has been in operation for the last 93 years. 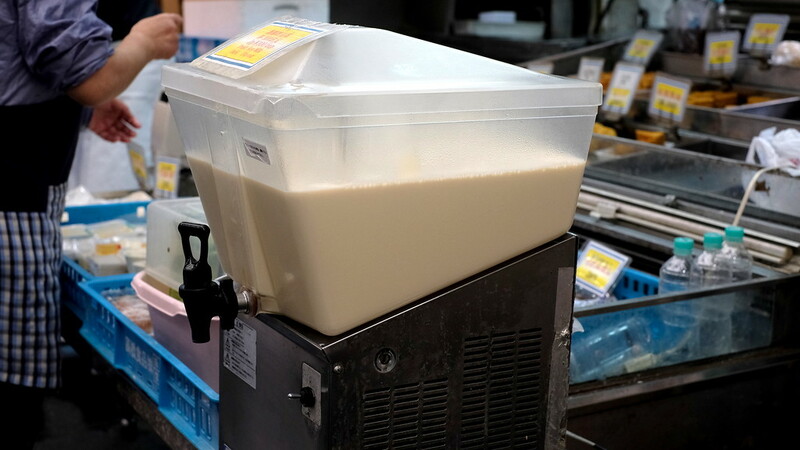 It looks entirely unremarkable and unprepossessing in its paper cup, but you should know that the neighbourhood tofu shop is a dying breed in Japan, and not every tofu shop makes unsweetened soy milk worth drinking. JPY70 nets you a rich, creamy drink that’s a far cry from any of the vile, vanilla-clogged cartons in most North American supermarkets. Imagine a soy version of full-cream Jersey milk, a non-dairy glass of Sainsbury Gold. Once you begin to appreciate the natural sweetness of good soybeans, drinking soy milk sans sugar will become your new normal. It’s almost enough to make me forgo a morning cup of coffee. Almost. The only other thing I want to eat in Kuromon is oden from Ishibashi Shokuhin. 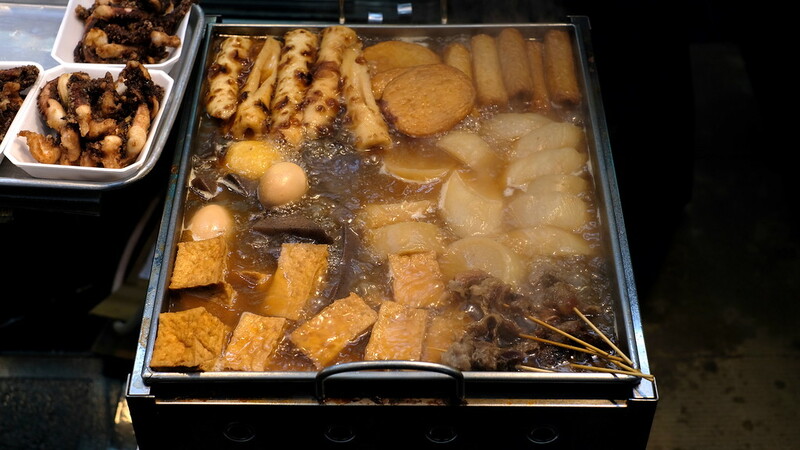 Describing oden to the person who hasn’t eaten it before is a little tricky. Think items like tofu, fishcakes, daikon radish, and konjac jelly, simmered and bathed in a sweet-savoury dashi broth. You’ll know it when you see it, for example, at the counter in convenience stores. Some people have told me that they don’t get oden. I think it is a matter of trying the good stuff, and Ishibashi Shokuhin is a very decent place for a first oden experience. 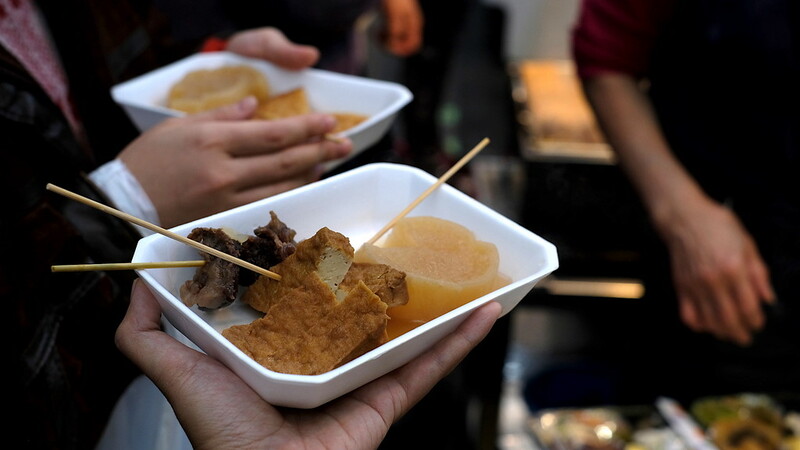 I often wish Ishibashi Shokuhin were in my neighbourhood so I could have their oden for breakfast most mornings. You might want everything bubbling away in the pot - chunky triangles of tofu, circles and hollowed-out tubes of fishcake, fist-sized hunks of daikon radish. Everything has soaked up the broth but retains its texture. The beef might be challenging for most people first thing in the morning but everything else is gorgeous. It must all be eaten while still hot enough to burn your mouth. Lukewarm oden is a disappointment, like a Tinder date who doesn’t resemble their photos. Eat while standing to the side of the shop, warming up slowly with each bite. You might strike up a conversation with the 23-year-old Osakan girl standing next to you, who lives in Tokyo but hates big city life, who misses the taste of Osaka. “You just don’t get this in Tokyo,” she tells you, biting into a hunk of daikon. “Everything there tastes like seasonings straight out of the bottle.” You may commiserate with her as the both of you eat. You’ll drink the broth down to the last drop before wishing you had space for more. Directions: Take Exit 10 from Nippombashi Station. Once you’re above ground, walk straight (do not cross the road) - you know you’re going the right way if you see UCC Coffee Plaza on the opposite side of the road on your right. The entrance to Kuromon Market is just ahead on your left. Takahashi Shokuhin is a few doors away from the entrance of the arcade to your right. For Ishibashi Shokuhin, walk straight after Takahashi Shokuhin and turn right when you reach the intersection in the middle of the market. 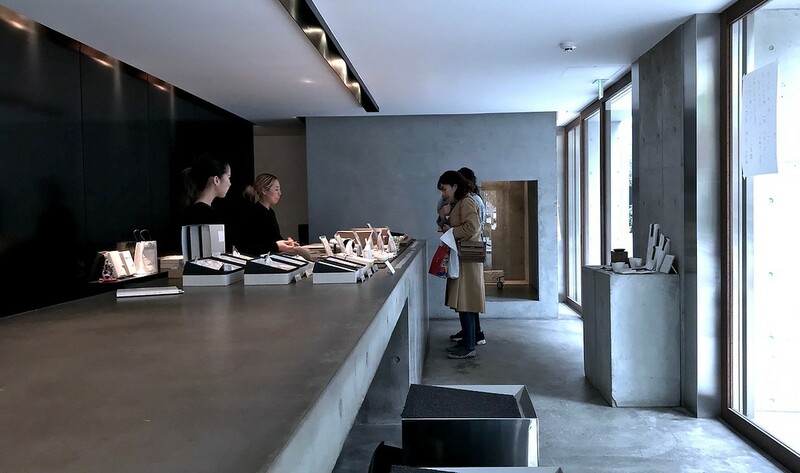 Ishibashi Shokuhin will be on your left a little after the first block of shops. Look for the teal-green awning. By this point, you will want to escape the tourists congregating in Kuromon Market for overpriced sashimi and Kobe beef skewers. If you haven’t already had coffee, this is the time for one. 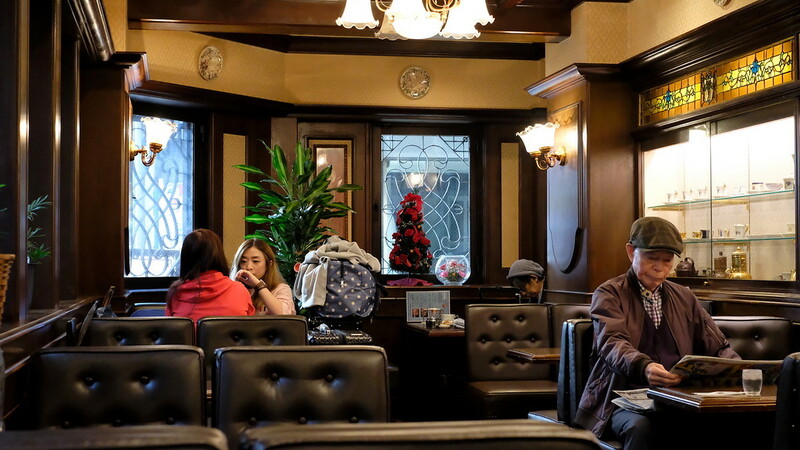 Forget the hipster cafes and head to a kissaten, an old-fashioned coffee house where the brews err on the side of dark, black, and strong. Kissaten are a dying breed in Tokyo, and can be a little precious at times because of that rarity. But in Osaka, they are still very much part of the downtown shopping street landscape. Thank goodness for that. Marufuku Coffee in Sennichimae is veritable Osakan institution. In operation since 1934, it’s counted luminaries like post-war jazz singer and “Queen of the Boogie-Woogie” Kasagi Shizuko and rakugo comedian Shofukutei Shokaku among its clientele. Here, there are stained glass panels above the glass cabinets and the floors are dark brown wood. The background music is a questionable mix of easy listening island Calypso and mediocre covers of top 1750s piano hits. The elderly lady behind the counter looks as though she could tell you a juicy story or ten about the patrons here. You will still find elderly men and women here, dapper in their berets and suits. They might be reading paperback novels or newspapers over their coffee, perhaps nibbling at one of Marufuku’s gorgeous little cakes, or a plate of sandwiches cut into dainty rectangles. 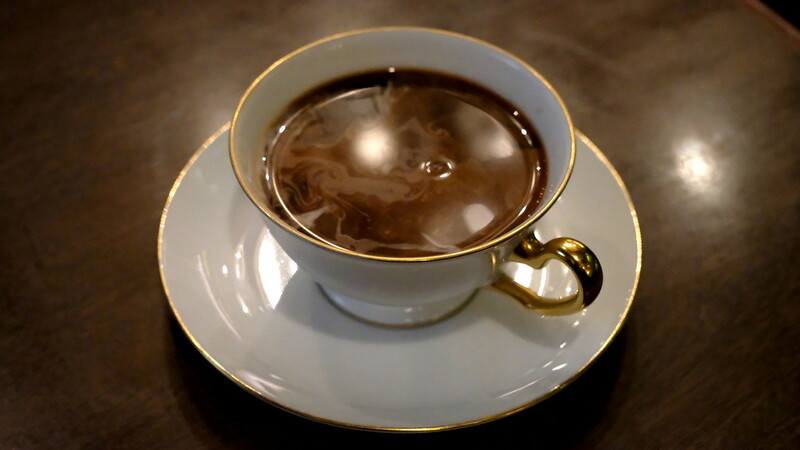 Their black coffee is in the classic kissaten style - dark, strong, rich, and almost certainly too burnt for most aficionados accustomed to lighter, juicier third-wave coffees. You will almost certainly want the tempering presence of a tiny thumb-sized pitcher of milk, if not also the sugar. Sip slowly. Recalibrate. Contemplate your next work of art. 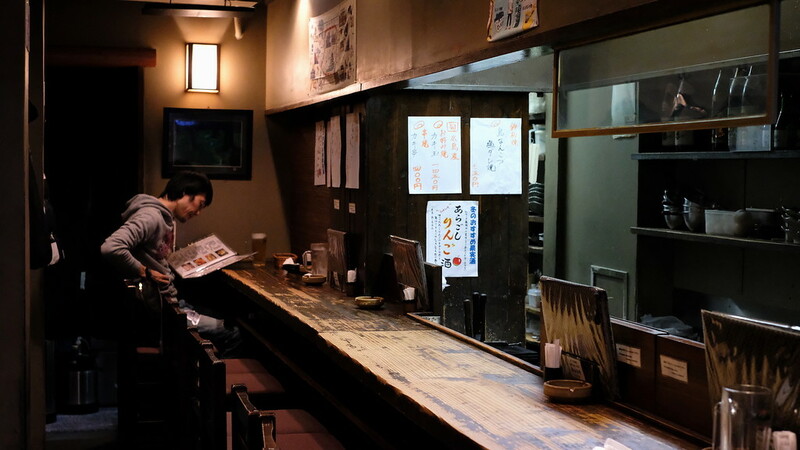 Marufuku is accustomed to non-Japanese speakers popping in, as evidenced by the free WiFi and English-language menu. It’s near enough the central shopping areas to be convenient, but just far removed enough to feel a little hidden and not completely packed with tourists. It is distinctly out of sync with modern times, and that’s exactly how I like it. Directions: Make your way back to the starting point where you entered the market. Cross the road to UCC Coffee Plaza. Turn right, walk straight, and then turn left at the corner. Walk straight until you encounter a traffic light and a crossing leading to the right. There’ll be a highway above, and a covered shopping arcade (相合橋筋 Aiaibashisuji) across the large street. Cross the road and enter the arcade. 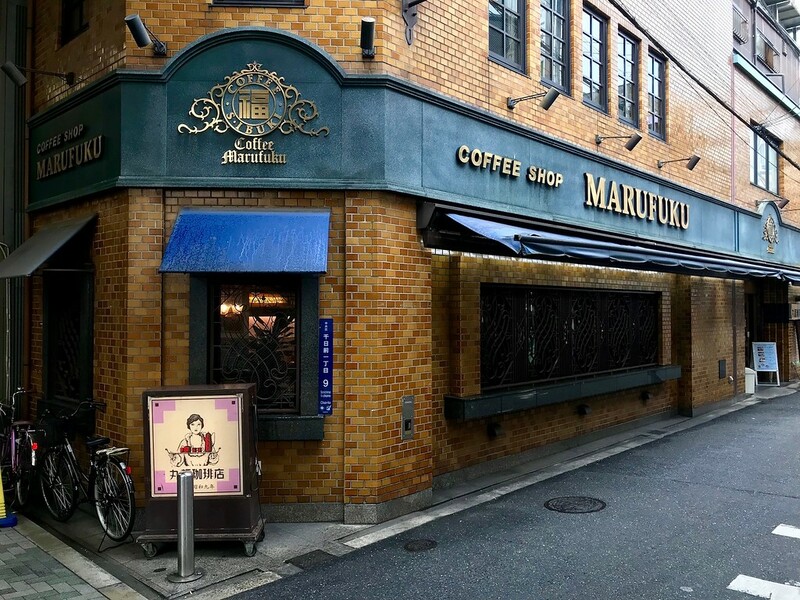 Marufuku Coffee is on the corner of the first turning to the left. It would be sacrilegious to visit Osaka and leave without eating okonomiyaki. 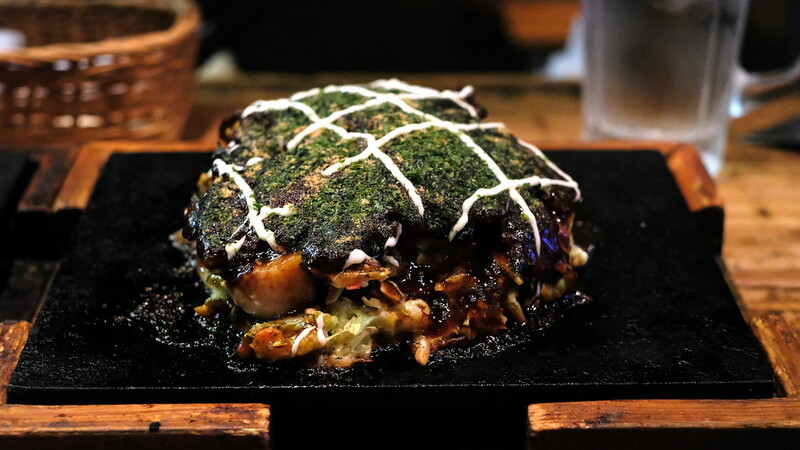 Translating to ”grilled as you like it,” okonomiyaki is not pizza, as it is mistakenly referred to at times. It’s more like a cross between a frittata and a pancake. You begin with masses of shredded cabbage held together by a batter of grated mountain yam, wheat flour, egg, and dashi broth, along with the add-ins of your choice. Pretty much anything goes: shrimp, squid, pork, innards, ginger, cheese. Top it all with lashings of tangy brown sauce - de rigueur in this dish - and a scattering of fragrant green seaweed. A fistful of skipjack bonito flakes dancing in the heat wouldn’t go amiss either. 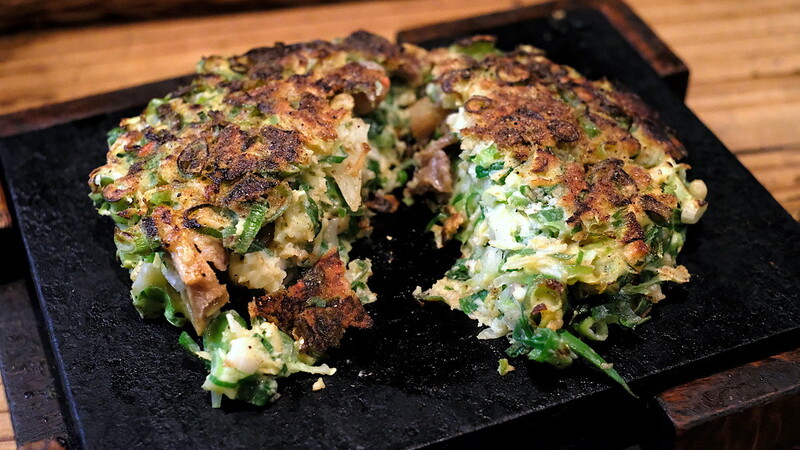 Competition is stiff for okonomiyaki specialists in Osaka. The Namba and Dotombori areas are home to so many: Fukutaro, Chibo, Ajinoya, and Kiji, just to name a few. To follow coffee at Marufuku, though, I like Yakizen a great deal - a short hop and skip away in Hozenji Yokocho. 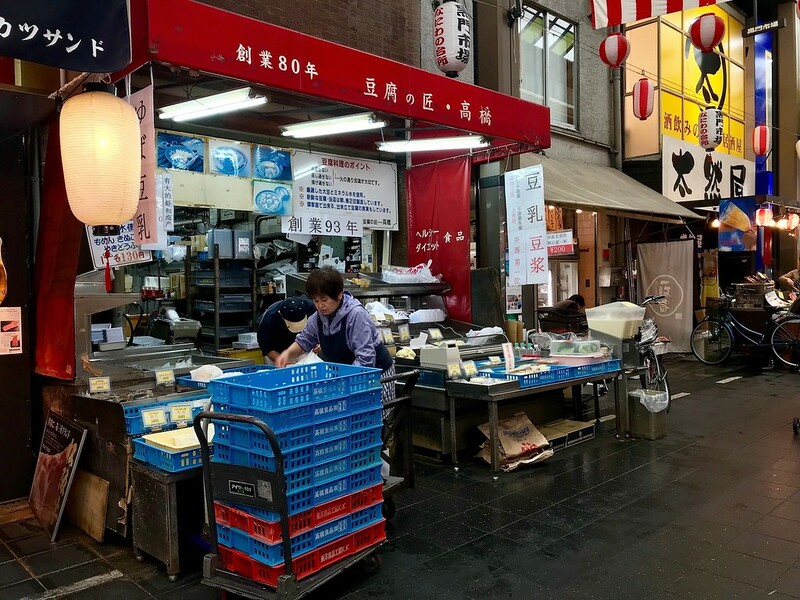 Once a relatively hidden slice of central Osaka you had to stumble upon, Hozenji Yokocho is much more prominent on the tourist trail these days for the dozens of restaurants crammed into a narrow strip of street. The lush, moss-blanketed Fudō Myō-ō statue in Hozenji Temple nearby doesn’t hurt either. It’s worth returning at dinner when the lanterns transform the narrow, cobblestone-paved streets into a scene from several centuries hence. But for now, you’re at Yakizen for lunch. 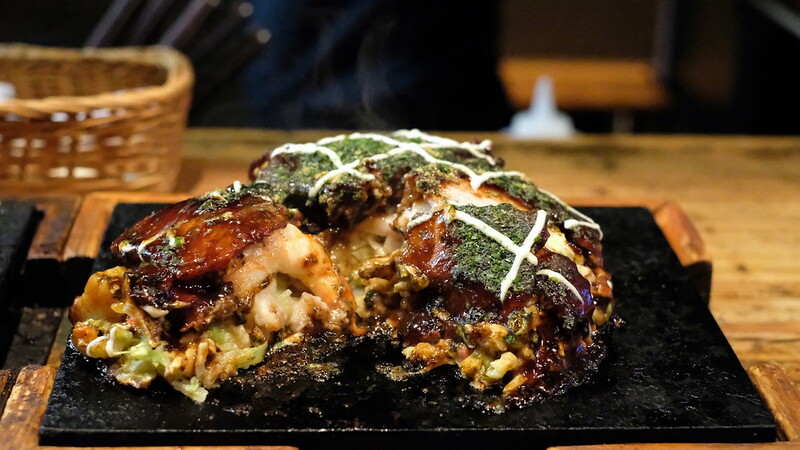 Like any good okonomiyaki place worth its sauce, Yakizen’s menu is reasonably extensive, and features a special stuffed silly with ingredients. You may as well order that. The Hozenji-yaki special is crammed full of squid, pork, prawns, and scallops. Those with seafood allergies, you have been warned. I love Hiroshima-style okonomiyaki more (Osaka-style is usually too heavy for my tastes) but Yakizen’s version makes me seriously question my loyalties - viscerally and loudly at the counter with every bite. If you are here with a friend, you should also order the negiyaki. Negi are Japanese leeks, something like a cross between scallions and Welsh onions. If you love them, you love them - they have a green, aromatic, peppery bite like nothing else. There is something magical about a fuckton of chopped negi held together by the barest amount of batter, griddled until crusty on the bottom, but soft and pillowy within. This negiyaki is also studded through with sweet, tender stewed beef tendons, though you wouldn’t know it without prior warning. It works: the freshness of the negi removes any potentially off-putting offal-y odour. For negi lovers like my dining companion, this is the sort of dish that sends you into a rapturous silence. But it is also the sort of dish that will take time to arrive at your table. Do not expect instant gratification: you cannot rush Maillard reactions, and it needs a slow burn on the hot plate to form that beguiling crust. Directions: Exit Marufuku Coffee, turn left and walk straight until you reach a covered shopping arcade. This is the Sennichimae Shopping Arcade. Turn right. Walk straight and take the third turning on the left into Hozenji Yokocho - it’s a narrow slip of an alley between Yakko and Ichibazushi (with a white lantern outside). Yakizen is on your left about halfway down the alley. With a space that’s all gray and white concrete, Shizuku is the kind of space more reminiscent of a sleek cocktail bar than a Japanese sweets spot. Even the background music reinforces this impression. Imagine the kind of low-key electronic music playing in a bar populated by beautiful models turning their heads slowly as the camera pans across the room, and you’ll have an idea of what it’s like entering Shizuku. 3 in the afternoon is oyatsu time, as they say here in Japan - that time of the day for a sweet little pick-me-up. Many things would fit the bill. But today, mochi rice cakes at Shizuku make a beautifully posh counterpoint to a day of street-style B-grade gourmet eating. 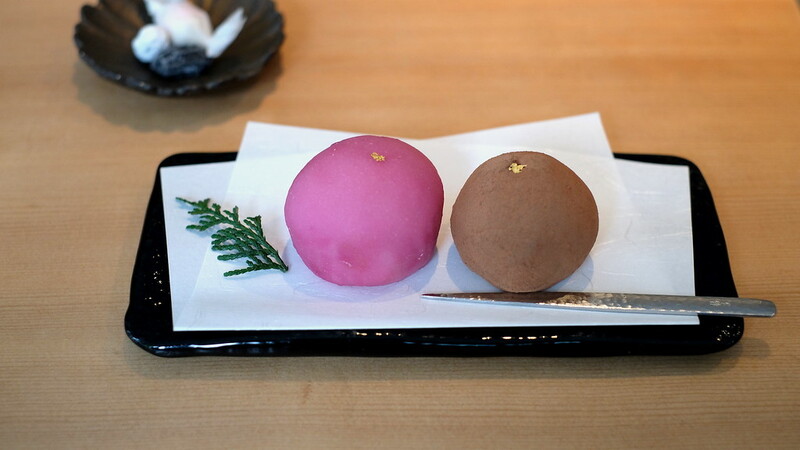 To call what Shizuku serves “mochi,” though, is like referring to Tiffany’s jewelry as “baubles.” These daifuku are not your average supermarket rice cakes, as tasty as those might be. These are of a more rarefied ilk, a glorious blend of Japanese technique and Western dessert flavours. Take the framboise daifuku mochi. How can one resist something so delightfully pink? It sparks joy even before you taste it. Beet juice gives it that pinkness; no artificial colourings to be found here. Inside a thin, tender, elastic mochi shell is rum-spiked white bean paste, which in turn conceals an almost effervescent sweet-tart raspberry center. I dislike red bean paste, finding it too heavy and stodgy, but white bean paste has a comparative lightness that adzuki beans just cannot match. One mochi is not enough, of course. 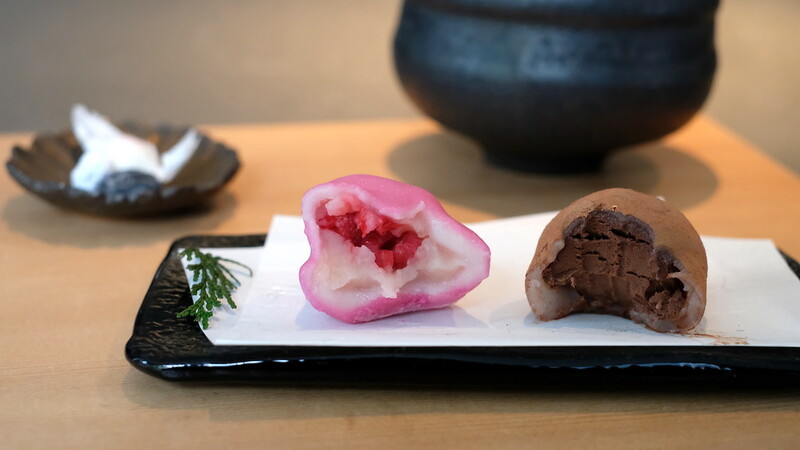 You may also wish to try the water chocolate daifuku. The same elastic mochi shell is stretched over a chocolate ganache - a whipped chocolate filling - that’s at once rich and light. It is water-based rather than cream-based, giving it a clarity of flavour one doesn’t get when dairy fat muddles the taste of chocolate. 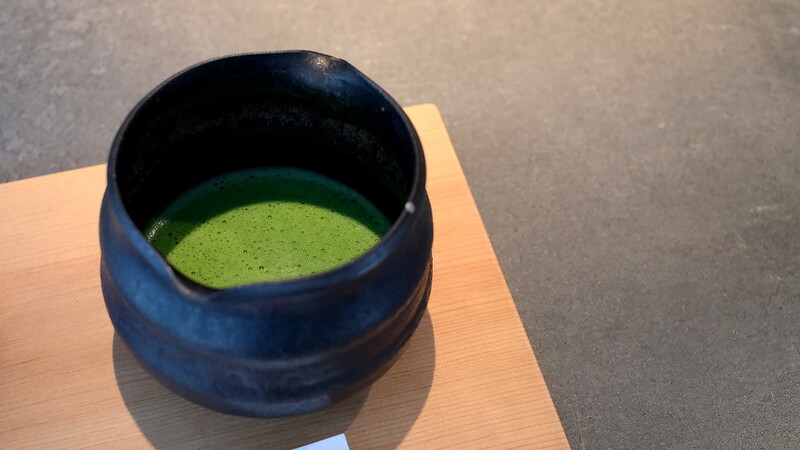 A cup of whisked matcha, grassy and lightly bitter, is the ideal accompaniment to these snacks. Directions: Exit Yakizen and turn left, walking straight to leave Hozenji Yokocho. Turn left when you’ve exited the alley. Turn right after the Kamigata Ukiyo-e Museum and walk straight. Keep walking straight until you reach the main road, and take the nearest underground entrance to Namba Station. Board the Midosuji Line train and ride it to Shinsaibashi Station. Alight and take Exit 3. Once you’re above ground, walk west for about 500 meters along Nagahori-dori Street. You’ll know you’re going the right way when you pass Hair Salon iBaco, capsule hotel a-STYLE, and a Lawson’s on your right. You’ll reach a fairly nondescript looking street on your right, with a dark grey building on the right and a building called Grand Square on the left. Turn right into this street. Walk straight for about 200 meters, passing a pizza restaurant on your right. Shizuku is on the corner of the building block ahead. Decision paralysis is a real problem when contemplating dinner in Osaka. Fine-dining options in the city abound, but when I’m here, all I want is something unpretentious, satisfying and rib-sticking. 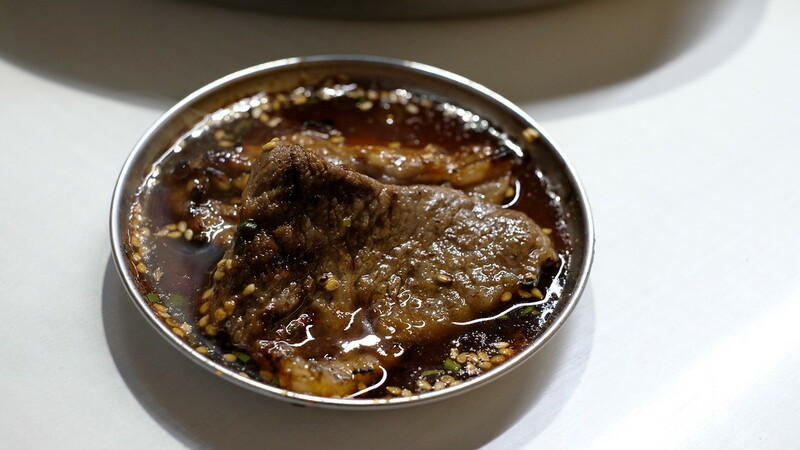 There is no better food than yakiniku, or Korean barbecue, and in Osaka there is no better place to head to for this than Tsuruhashi. Tsuruhashi is Osaka’s K-Town. Straddling the borders between Tennoji and Ikuno wards, it’s largely populated by residents of Korean descent who run shops in the covered shopping arcade hawking everything from kimchi to K-pop calendars. There’s more than a hint of weather and age in the narrow shotengai, and it feels like Shinsekai before the authorities began cleaning it up in preparation for the influx of tourists. 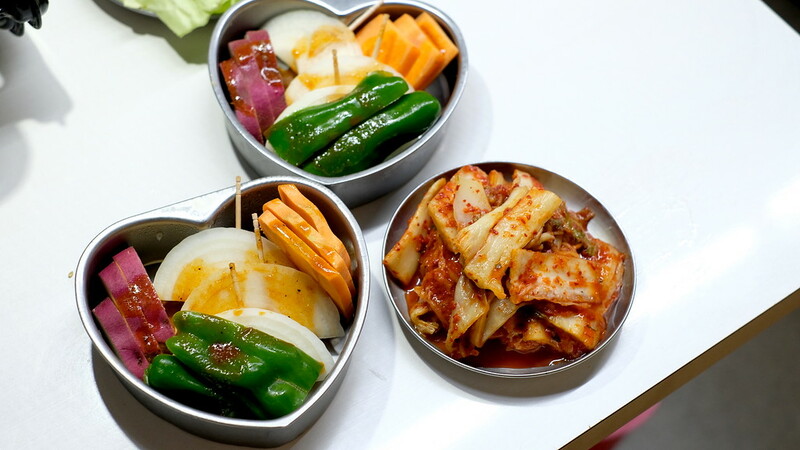 Chat up the lovely ahjummas and sample some of their kimchi if you have time, but don’t forget the real mission. You’re here for grilled beef. Just beyond the shopping arcade is a warren of yakiniku restaurants, lining alleyways just wide enough for three or four to walk abreast. You will have smelled them as you exit the station. The smoky whiff of grilled beef parts permeates the air, enveloping you in a bovine olfactory cloak of sorts. This is a promise of good things to come. You could walk into most of these places and have a perfectly reasonable dinner of grilled beef. However, not all yakiniku restaurants are created equal. Here are a few words of advice for the adventurous: wander into the restaurants without a member of staff standing outside, cajoling you indoors with a menu in hand. Walk into a place that’s at least half-full. If you can’t see what’s going on inside, don’t be afraid to slide the door open and poke your head in. (I fully endorse this. They will not remember you the next day.) If you like the vibe, try your luck. You have nothing to lose. If you’re feeling particularly adventurous, you could try a place like Sora. It’s perpetually busy and it might be worth making a reservation. You’re not here for the finest melt-in-your-mouth wagyu, which would cost you three times as much as what you’ll pay here. You’re definitely not here for the functional, at times patchy service; nor are you here for the non-existent decor, which consists of fluorescent lighting and little else. In fact, if you swapped out the grills and overhead ventilators, this could be an office space. 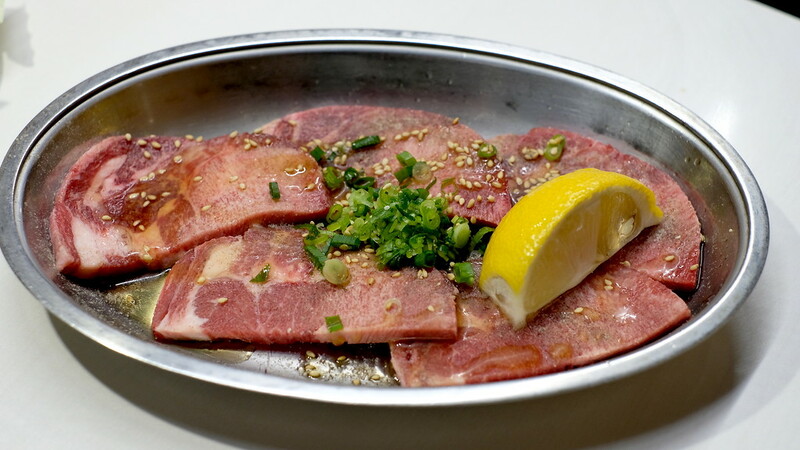 What Sora does have is a wide, no-nonsense selection of beef and pork parts. It also has smoke, verve, and atmosphere in spades. I come here for a down-to-earth dinner, where the meat arrives in puddles of sweet-salty sauce on metal trays and the beer in large flagons. The beef doesn’t taste like it hd spent its life being massaged into mindless oblivion. It bites back. It tastes like it had a life outdoors. I love watching the oil and juices drip into the fire, the flames licking strips and squares of fat-ribboned meat. 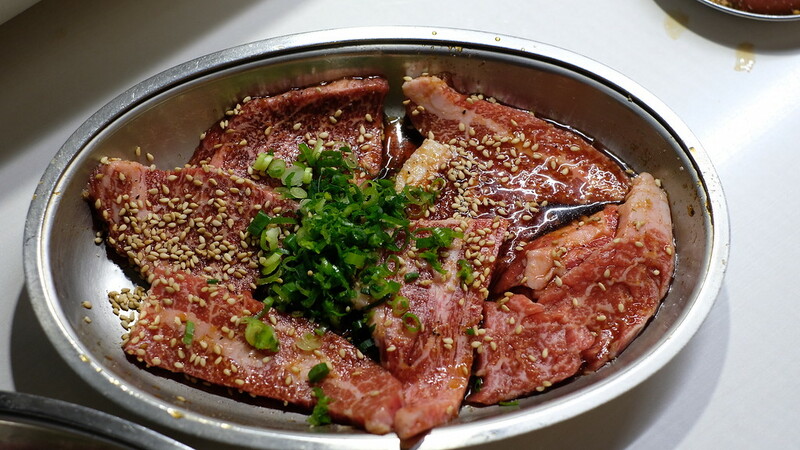 A yakiniku restaurant is the place to be adventurous with meat parts. Kalbi (short ribs), harami (skirt steak), and rosu (shoulder/back meat) are all safe choices; but try venturing into other parts of the cow and order some tan (tongue), liver, or jo-mino (first stomach; intestine part). The pork neck is my personal favourite - meaty and hearty, striated with just enough fat, walking the line between tender and resilient. You will walk out of a place like Sora with your clothes reeking of beef, which, frankly, is not a bad way to go home at all. Directions: Walk back to Nagahori-dori Street the way you came. When you reach the main road, turn right. Take the first entrance you see underground to Nishi-Ohashi Station. Take the Nagahoritsurumiyokuchi Line (the lime green line) towards Kadoma-Minami Station for 6 stops. Alight at Morinomiya Station. 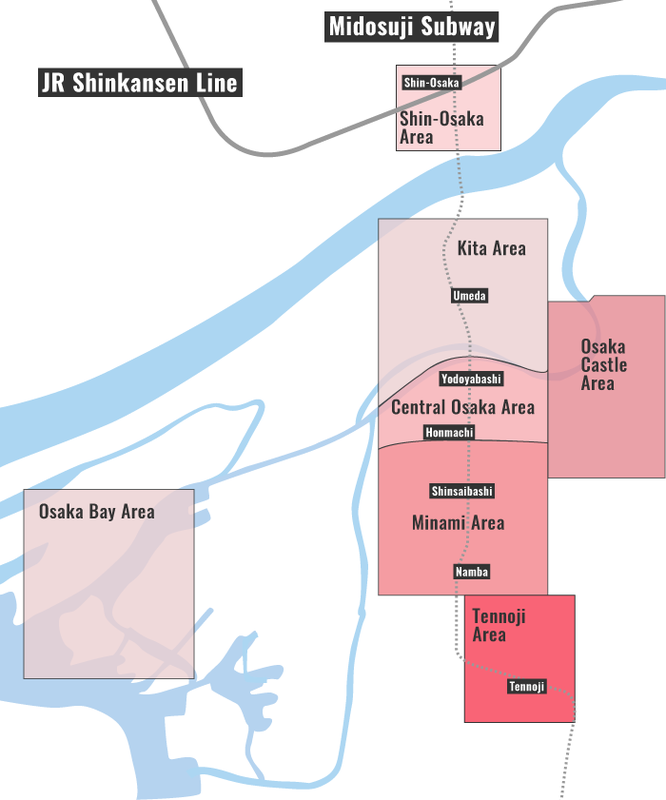 Transfer to the JR Osaka Loop Line and board the local train going clockwise. Ride it two stops to Tsuruhashi Station. Take the Central Exit. 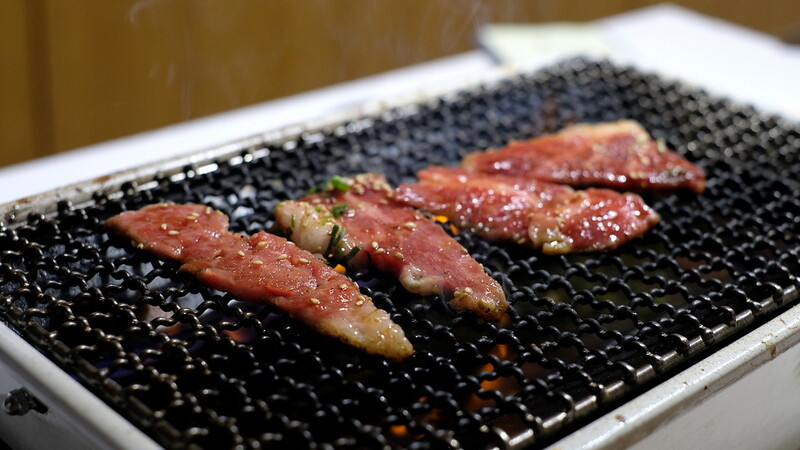 Walk straight into the warren of yakiniku restaurants. Sora’s main branch is on a narrow road just parallel to the main road at the end of the alley. If you have just one night in Osaka, this is the only reasonable way to end a full day of eating in the city: with an order of takoyaki from Wanaka. Takoyaki are golf ball-sized balls of gooey batter liberally studded with octopus bits, tenkasu (crispy tempura), and, depending on where you are, pickled red ginger. I realise takoyaki might be a hard sell for some first-timers, but it pushes all the same textural buttons as mac and cheese. There is also a palpable difference between takoyaki elsewhere and takoyaki in Osaka. Maybe it’s terroir, but there’s just an extra soupçon of magic that comes with eating takoyaki in its birthplace. You don’t even have to eat at Wanaka - you could head to shops like Yamachan, Kougaryu, or Takohachi. Your night is perfect as long as you’re eating takoyaki. 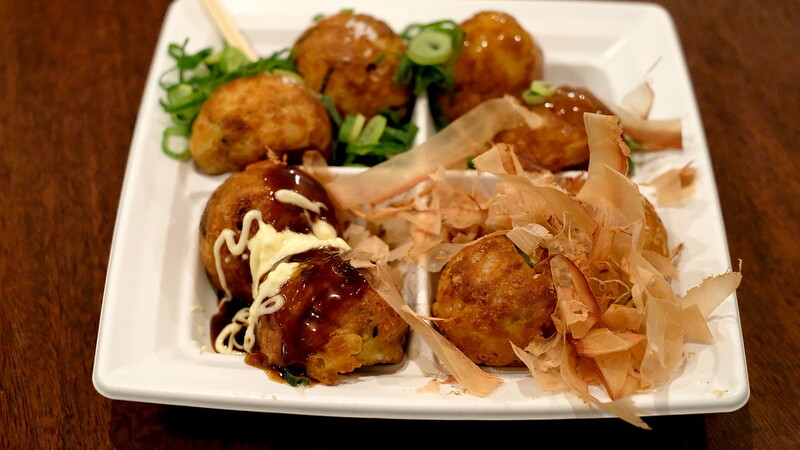 What you want at Wanaka is the お入りO-iri, a takoyaki sampler with four different toppings. You have the classic brown sauce, tangy and sweet and salty. There’s one dusted with Okinawan sea salt, heightening the umami in the batter. Another is drenched in dashi and soy sauce with a dusting of fragrant aonori (green laver) powder on top. Lastly, there’s one with a scattering of bonito fish flakes on top. A flagon of beer alongside is optional but highly recommended. Directions: Return to Tsuruhashi Station. This time, take the Kintetsu Nara Line bound for Osaka-Namba Station. Alight at Osaka-Namba Station. Find your way to Exit 11 (this will require some walking). Once you’re above ground, walk straight and take the first right. You’ll be inside a covered shopping arcade. Wanaka is located just before the first intersection inside the arcade. The Osaka Foodie Itinerary map shows the location of each of the places mentioned - you can view a full screen version too.